The John Wayne Film Society (Fan Club) was established in 1990 to encourage interest in the Films and Life of possibly the greatest Film Star of the Twentieth Century-John Wayne. We always welcome new members from all around the world to join our existing John Wayne Fans. The John Wayne Film Society was established in 1990, by myself-Patrick, my brother David and 2 other very keen John Wayne Fans, to encourage interest in the Films and Life of possibly the greatest Film Star of the Twentieth Century-John Wayne and to show John Wayne feature films on the big screen as they were originally intended to be seen to an audience of genuine John Wayne enthusiasts. The Society produces 2 professionally produced Members Journals per year (28 Pages in the Spring and 32 pages in the Autumn) - we also provide a Mail Order Service for DVDs, Books, CDs, Collectors Plates, Plaques, and many other quality ‘Duke’ related items. Items can be ordered either Online through our website, by Post or by phone at our Order Line Number. 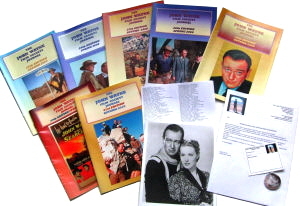 On joining the Society, you will receive an Initial Members Pack, which consists of the 6 latest JWFS Journals, a Members Badge, a John Wayne Black and White Still, a John Wayne Filmography & a John Wayne Film Society Membership card. During your 1st Years membership you will also receive 2 further JWFS Journals as they are published. (Members Pack pictured right). Our next John Wayne Film Society Convention will be in April, 2017 - Click Here to read more information about our conventions. We hope that you will become and enjoy being a Member of the John Wayne Film Society. Inland UK - Membership £10.00 Inc P&P for the first year. Europe - Membership £12.00 Inc P&P for the first year. Worldwide - Membership £15.00 Inc P&P for the first year. Please do not hesitate to contact us if you have any further questions or require any more information regarding the John Wayne Film Society – John Wayne Fan Club Click Here to contact us by e-mail. We will be happy to help with any payment, subscriptions or general Film Society / Fan Club enquiries. We try our best at all times to respond to Email enquiries within 24 hours.